I came up with this idea on a whim on one of our days stuck home waiting for the antibiotics to kick in while Ethan grumpily battled strep and a double ear infection. My husband's unread Wall Street Journals were calling to me as we began to go stir crazy. 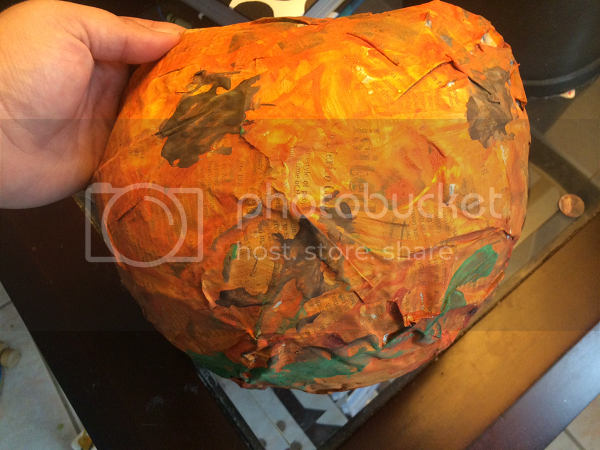 We've done paper mache before and our creation just didn't turn out (turns out toddlers like to glob on way, way too much glue), so I didn't really expect miracles with this one. Hence the no pictures of the entire process...which I'm kicking myself for now, because our final product not only turned out but turned out really cute. Ethan is so proud of his trick or treat bucket and it just added to the excitement towards Halloween coming up! So, here's a recap with less than stellar photos that I mostly only took to send my husband apologetic pictures about what we were doing with the Wall Street Journals he never read. 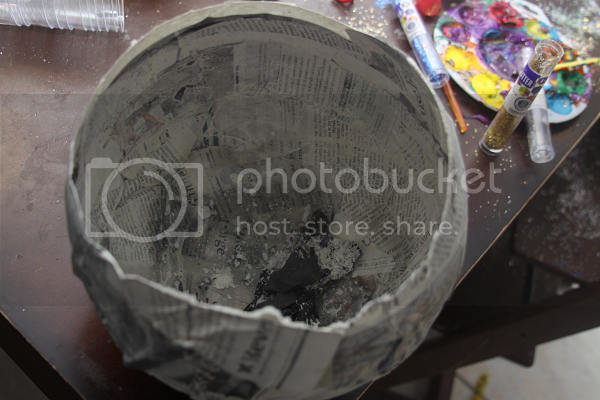 Make your paper mache glue. We mixed 1 part flour with 2 cups water, added a teaspoon of salt and a few squirts of white school glue. I also pre-shredded the newspapers so Ethan could easily pull the scraps of a bag to use rather than rip his own which quite possibly could have taken forever. Make your shape. 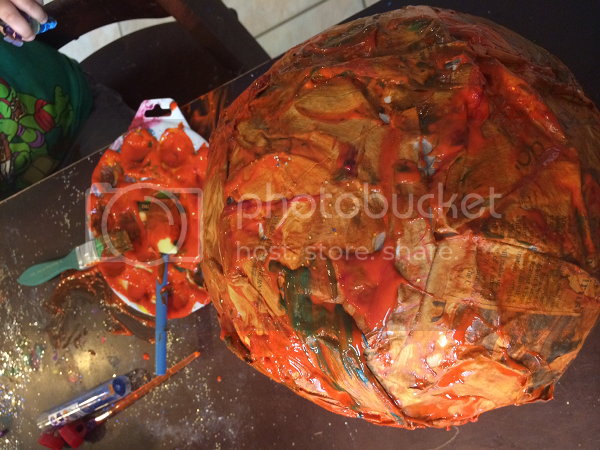 We blew up a balloon really, really big and covered a little more than half with the paper mache glue and newspaper scraps. Let it dry. This took, like, three days. Something about toddlers and heaping globs of glue. 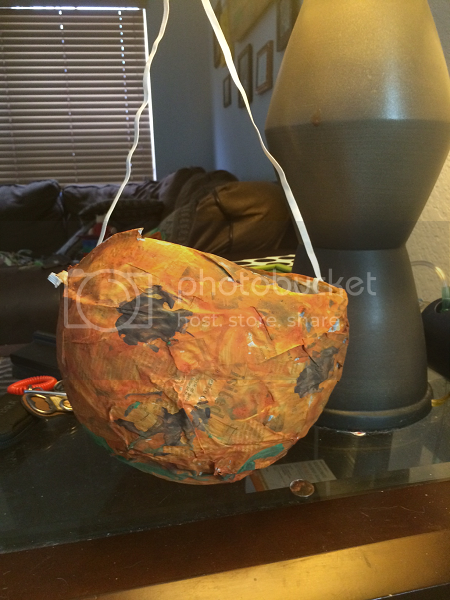 I put the knotted side of the balloon (which was the side we didn't cover in glue and scraps) in a jar to get it to stand upright. This helped a lot with the drying time. Pop the balloon. Once dry, pop the balloon! This didn't please Ethan at all. Paint your pumpkin. Now it's time to paint your pumpkin. Ethan's faith in this project was restored. My entire house remained covered in orange paint for a good three days. Good times. Have your toddler paint on a face. We were all out of black paint, but Ethan settled for brown for the eyes. He insisted it needed a green mouth, though, and a smiling mouth so it wasn't too spooky. I think he did a great job! Add the strap/handle. Once it dried, I punched two holes in the side and tied a piece of elastic to each end for the strap. And there you have it! 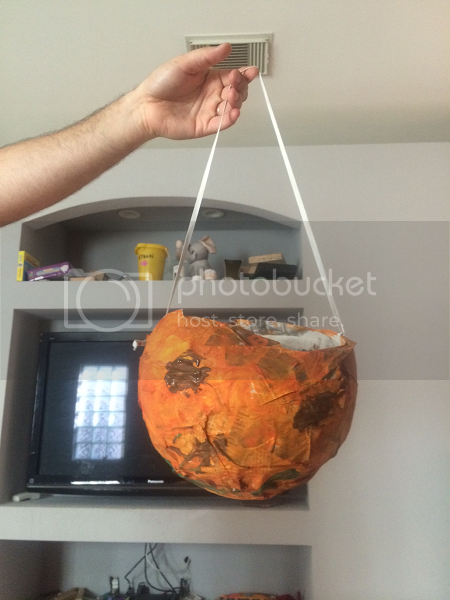 Your toddler's very own homemade trick or treat pumpkin bucket! Ethan is so proud of his bucket and can't wait to use it. I think we'll do a homemade bucket every year -- it's too much fun not to!